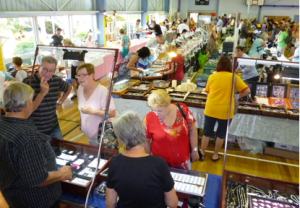 Each year on the first full weekend of March, the North Brisbane Lapidary Club hosts a Gem and Jewellery Festival. The gem show has been run continuously since 1983. 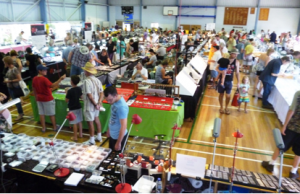 We believe one of, if not the best, gem shows in SE Qld. Planning for the 2019 show is now under way. Within the hall are Exhibitors selling rough gemstones, faceted stones, cabochons of gemstones and opal, jewellery, fossils, mineral specimens, lapidary tools and equipment and much more. There are also demonstrations, of faceting, by members of the Australian Faceting Guild. 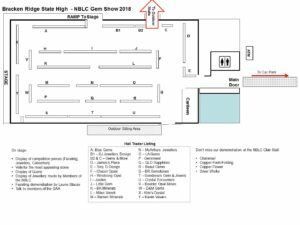 A list of Exhibitors and what they sell is here. Visitors to the gem show can view one of the widest variety of coloured gemstones on display at any one time. Dealers will be happy to make recommendations on the best type of gemstone for various jewellery items. Other dealers will sell jewellery items or visitors can discuss their personal needs with manufacturing jewellers in attendance. Gemstones that will be on sale include sapphires in all of the range of colours, rubies, emeralds, tanzanite, beryl, chrysoprase and opal. Rockhounds and mineral collectors will be catered for by several high quality mineral dealers who specialise in both Australian and imported mineral specimens. Crystals for those within an interest in the metaphysical will be on sale. An excellent variety of fossils; ideal for anyone starting out or advanced collectors; will be available for purchase. For lapidary hobbyists (gem and rock cutters) there will be dealers selling tools, consumables and machinery to help you turn rocks into gems. For children there will be lucky dips with rocks as the central prize and fossicking where a bucket of gem wash is purchased washed, sieved and sorted. Likely finds will be garnets, zircons or quartz crystals. Refreshments at reasonable prices; food cooked freshly on site, will be available. Hot and cold drinks will be on sale. The dealer locations within the hall are currently being finalised. Before coming to the show why not print out a copy of the layout so you know where your favourite dealers are. The outdoor trader area is partially under full cover and partially under shade and is close to the dealers’ hall. Before coming to the show why not print out a copy of the layout so you know where your favourite dealers are.